See section 1.4 for Importing/Exporting files. See section 1.19.7 for Primer Summary Table information. In Vector NTI Advance you can either export Oligos as a csv file or as the archive oa4 file format. The export process as well as the import process into Genome Compiler are quite similar. The main difference is the need to rearrange the csv file format which can be dismissed when transferring an oa4 file. First step- Export from vector NTI as CSV or Oa4 file. In vector NTI open the Oligos table in the vector NTI database, select the required oligo/s and either right click (Figure 3.2.1.3.1) or go to “Oligo” in the main menu and choose “Export” (Figure 3.2.1.3.2). In both cases you can choose “Selection into Archive” for exporting as oa4 file or “Selection into CSV” for exporting as a csv file. In the “Write Oligo(s) To” window choose Oligo Archives (.oa4) or Oligo Export CSV (.csv) (Figure 3.2.1.3.3) according to your previous file export selection. Figure 3.2.1.3.1: Export oligos from vector NTI through right click. 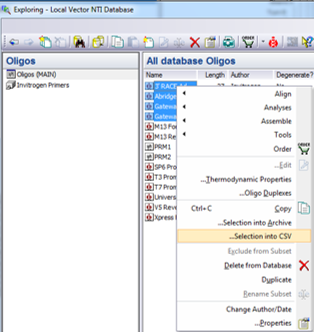 Figure 3.2.1.3.2: Export oligos from vector NTI through “Oligo” in the main menu. Figure 3.2.1.3.3: Save your oligos through "Write Oligo(s) To" window in vector NTI. Second step- necessary for importing a CSV file only- Arrange the CSV file. After exporting the file, you should open it in Excel and rearrange it in the right order to fit the Primer/Oligos table in Genome Compiler (Figure 3.2.1.3.4). 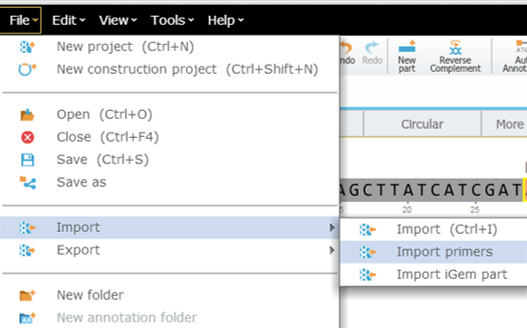 Figure 3.2.1.3.4: Rearrange the file from vector NTI to fit Genome Compiler. Third step- Import to Genome Compiler. Starting with your target project open, navigate to the menu bar and select “File,” then “Import,” and then “Import Primers” (Figure 3.2.1.3.5). The “Import Primer” dialog box will then open where you can upload your primer library (Figure 3.2.1.3.6). For CSV file first verify that your file is in line with the file format described in the top of the dialog. 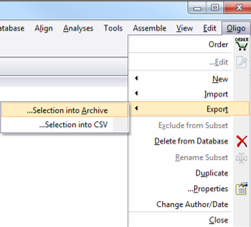 Then select “choose a file” to choose the appropriate CSV or Oa4 file. The primers will then be imported into the Import Primers dialog where you can select the checkboxes of the primers you would like to detect in the project and then “Import”. The primers which are complementary to your sequence will appear on the sequence (Figure 3.2.1.3.7) as well as in the Primer Summary Table for that specific project (Figure 3.2.1.3.8) (see section 1.19.7 for Primer Summary Table information). Figure 3.2.1.3.5: Opening "Import Primers" dialog box in Genome Compiler. 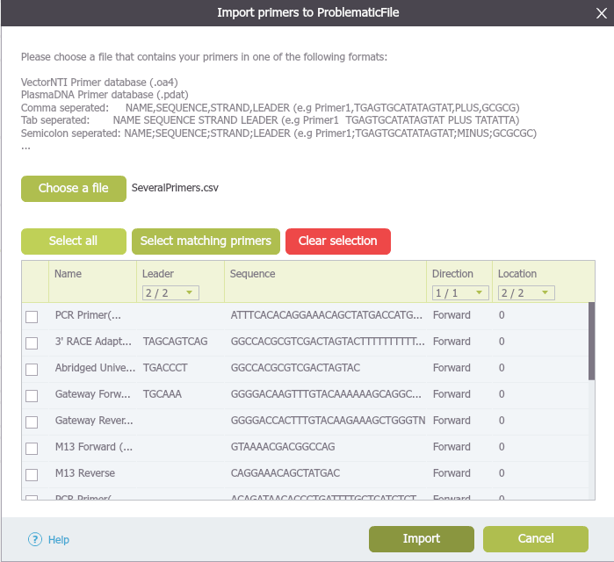 Figure 3.2.1.3.6: Upload your primer library through the "Import Primers" dialog box. Figure 3.2.1.3.7: Complementary primers will appear in the sequence view. Figure 3.2.1.3.8: Complementary primers will appear in the project Primer Summary Table. Note: If the primers you imported are not complementary to anywhere on the sequence then they will not be added to your project or saved anywhere inside the program. For more information on importing/exporting files please refer to section 1.4.